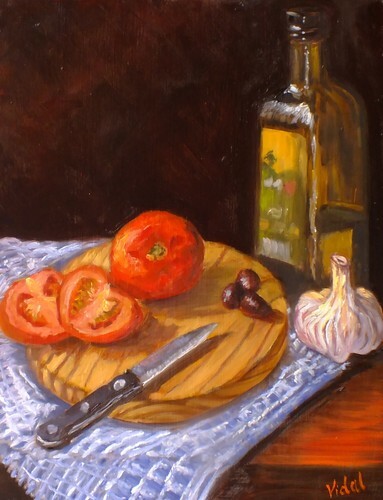 The aim of this course is to help you master the use of this versatile medium focusing on still life, portrait and Landscape Painting in a realistic style. Although acrylics are accepted, certain techniques will be harder to achieve. To join this course it is important that you have a foundation of drawing and/or painting. If you do not know how to draw then please join the Monday class. In this class I do not teach modern art and the training is entirely based on painting realism/impressionism. Although there is a structure behind the training schedule, there are no time-frames and every person can move forward at own pace. Initially subjects are chosen by the teacher in order to tackle various techniques in colour mixing and brush work. Advanced students will be allowed to choose their own topics. As subject matter we will be using still life, portrait, animals, landscape, mastercopies. On the first day you do not need to bring anything as the teacher will discuss what you need. - A set of brushes suitable for oils (Hogs Bristle) or acrylics (synthetics) of various sizes (preferably 2 of each size). Flat brushes are preferred. Please do not buy these from the Dollar stores or other stores other than an art store.